In the end the score-line was harsh on the Team of Choice, who had put in a spirited and exciting performance, playing their part in an eight-goal thriller. United had taken a two goal lead into the half time break thanks to goals from Kurt Lentjies and Thamsanqa Teyise, only to see Chiefs hit back with three goals in the opening 18 minutes of the second stanza, Maritzburg levelling through a Siyanda Xulu own goal to take the match into extra time. Maritzburg were ahead within a few minutes of kick off when Mohammed Anas hustled the ball off the Chiefs defence, Kurt Lentjies picking up the loose ball and doing superbly to round goalkeeper Reyaad Pieterse before scoring from a tight angle. 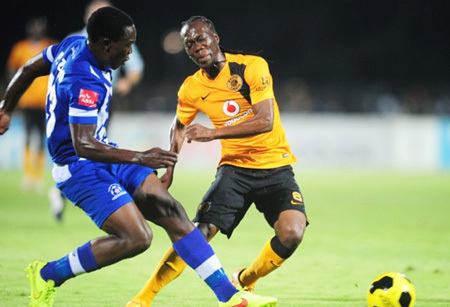 Maritzburg continued to look lively on the ball, laying some fluent football, although Chiefs were always dangerous on the ball. The KZN side were to double their lead ahead of the break when Teyise powered home a header from a corner kick. But the home side came out firing after the restart, quickfire goals from George Lebsese (2) and Bernard Parker putting the defending champions in front midway through the second half. The game remained evenly balanced, Madla Ncikazi's side playing some excllent football at times as they fought back into the game. A brilliant through ball by Ryan de Jongh was to result in an own goal as Xulu headed the ball past his goalkeeper as he back-peddled towards his own goal; 3-3 after 83 minutes. The Team of Choice looekd set to take the game to penalties, but had their hearts broken late on with two very well taken goals in the second half of extra time by Xulu and Pule Ekstein.